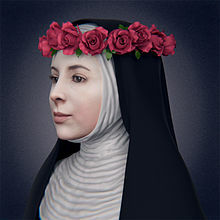 Saint Rose of Lima, TOSD (April 20, 1586 – August 24, 1617), was a member of the Third Order of Saint Dominic in Lima, Peru, who became known for both her life of severe asceticism and her care of the needy of the city through her own private efforts. A lay member of the Dominican Order, she was declared a saint by the Catholic Church, being the first person born in the Americas to be canonized as such. 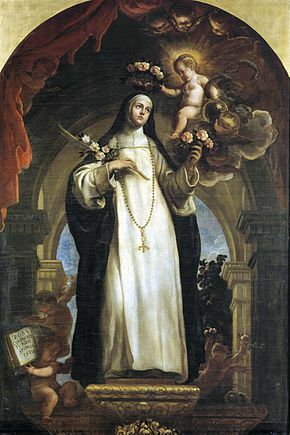 As a saint, Rose of Lima has been designated as a co-patroness of the Philippines along with Saint Pudentiana; both saints were moved to second-class patronage in September 1942 by Pope Pius XII, but Rose remains the primary patroness of Peru and of the indigenous natives of Latin America. Her image is featured on the highest denomination banknote of Peru. She was born Isabel Flores de Olivia in the city of Lima, then in the Viceroyalty of Peru, on April 20, 1586. She was one of the many children of Gaspar Flores, a harquebusier in the Imperial Spanish army, born in Puerto Rico, and his wife, María de Oliva y Herrera, a criolla native of Lima. Her later nickname "Rose" comes from an incident in her infancy: a servant claimed to have seen her face transform into a rose. In 1597 Isabel was confirmed by the Archbishop of Lima, Toribio de Mogrovejo, who was also to be declared a saint. She formally took the name of Rose at that time. As a young girl—in emulation of the noted Dominican tertiary, St. Catherine of Siena—she began to fast three times a week and performed severe penances in secret. When she was admired for her beauty, Rose cut off her hair and smeared pepper on her face, upset that men were beginning to take notice of her. She rejected all suitors against the objections of her friends and her family. Despite the censure of her parents, she spent many hours contemplating the Blessed Sacrament, which she received daily, an extremely rare practice in that period. She was determined to take a vow of virginity, which was opposed by her parents who wished her to marry. Finally, out of frustration, her father gave her a room to herself in the family home. 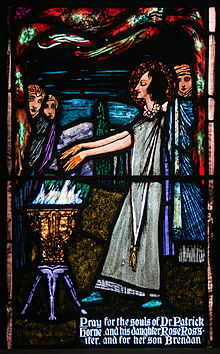 Stained glass window by Harry Clarke, located in St. Michael's Church, Ballinasloe, Ireland, depicting St. Rose burning her hands in an act of penance. After daily fasting, she took to permanently abstaining from eating meat. She helped the sick and hungry around her community, bringing them to her room and taking care of them. Rose sold her fine needlework, and took flowers that she grew to market, to help her family. She made and sold lace and embroidery to care for the poor, and she prayed and did penance in a little grotto that she had built. Otherwise, she became a recluse, leaving her room only for her visits to church. She attracted the attention of the friars of the Dominican Order. She wanted to become a nun, but her father forbade it, so she instead entered the Third Order of St. Dominic while living in her parents' home. In her twentieth year she donned the habit of a tertiary and took a vow of perpetual virginity. She only allowed herself to sleep two hours a night at most, so that she had more hours to devote to prayer. She donned a heavy crown made of silver, with small spikes on the inside, in emulation of the Crown of Thorns worn by Christ. For eleven years she lived this way, with intervals of ecstasy, and eventually died on August 24, 1617, at the young age of 31. It is said that she prophesied the date of her death. Her funeral was held in the cathedral, attended by all the public authorities of Lima. Her feast day is on August 23rd. Rose was beatified by Pope Clement IX on May 10, 1667, and canonized on April 12, 1671, by Pope Clement X, the first Catholic in the Americas to be declared a saint. Her shrine, alongside those of her friends St. Martin de Porres and Saint John Macias, is located inside the convent of St. Dominic in Lima. The Roman Catholic Church says that many miracles followed her death: there were stories that she had cured a leper, and that, at the time of her death, the city of Lima smelled like roses; roses also started falling from the sky. Many places in the New World are named Santa Rosa after her. Her liturgical feast was inserted into the General Roman Calendar in 1729 for celebration initially on August 30, because August 24, the date of her death, is the feast of Saint Bartholomew the Apostle and August 30 was the closest date not already allocated to a well-known saint. Pope Paul VI's 1969 revision of the calendar made August 23 available, the day on which her feast day is now celebrated throughout the world, including Spain, but excluding Peru and some other Latin American countries, where August 30 is a public holiday in her honor. She is honored together with Martin de Porres and Toribio de Mogrovejo with a feast day on the liturgical calendar of the Episcopal Church (USA) on August 23. Early lives of Santa Rosa were written by the Dominican Father Hansen, "Vita Sanctae Rosae" (2 vols., Rome, 1664–1668), and Vicente Orsini, afterward. Pope Benedict XIII wrote "Concentus Dominicano, Bononiensis ecclesia, in album Sanctorum Ludovici Bertrandi et Rosae de Sancta Maria, ordinero praedicatorum" (Venice, 1674). There is a park named for her in downtown Sacramento, California. A plot of land at 7th and K streets was given to the Roman Catholic Church by Peter Burnett, first Governor of the State of California. Father Peter Anderson built one of the first of two churches in the diocese to be consecrated under the patronage of St Rose. In the Caribbean twin-island state of Trinidad and Tobago, the Santa Rosa Carib Community, located in Arima, is the largest organization of indigenous peoples on the island. The second oldest parish in the Diocese of Port of Spain is also named after this saint. The Santa Rosa Church, which is located in the town of Arima, was established on April 20, 1786, as the Indian Mission of Santa Rosa de Arima, on the foundations of a Capuchin Mission previously established in 1749. St. Rose's skull, surmounted with a crown of roses, is on public display at the Basilica in Lima, Peru, along with that of Saint Martin de Porres. It was customary to keep the torso in the basilica and pass the head around the country. Saint Rose is the patroness of the Americas, of indigenous people of the Americas, especially of Lima, Peru, of Sittard in the Netherlands, of India, and of the Philippines. On the last weekend in August, the Fiesta de Santa Rosa is celebrated in Dixon, New Mexico. A barony of Saint Rose of Lima was created in the Royal House of Rwanda on 25 July 2016 by the Catholic king in exile, King Kigeli V of Rwanda. ^ a b c d e Marques, Luis Carlos L. (2000). "Rosa de Lima". In Leonardi, C.; Riccardi, A.; Zarri, G. Diccionario de los santos (in Spanish). II. Madrid, Spain: San Pablo. pp. 2003–2006. ISBN 84-285-2259-6. ^ a b c "CATHOLIC ENCYCLOPEDIA: St. Rose of Lima". newadvent.org. ^ a b c "St. Mark - Saint of the Day - AmericanCatholic.org". americancatholic.org. ^ Mills, Kenneth & Taylor, William B. Eds. "Colonial Latin America: A Documentary History". (2002) Oxford: SR Books. Page 205. ^ "Downtown Sacramento Partnership". Downtown Sacramento Partnership. ^ "Roman Catholic Diocese of Sacramento – History & Archives". diocese-sacramento.org. Archived from the original on 2008-01-31. ^ "Santa Rosa R. C. Church, Arima, Trinidad, West Indies". santarosatt.org. Retrieved 7 April 2018. ^ "Northern Light Catholic Parish". wixsite.com. Retrieved 7 April 2018. ^ "賃貸経営をするなら｜家賃保証サービスを利用するのが最適". www.strosesooke.org. Retrieved 7 April 2018. ^ "St. Rose of Lima". ^ "St. Rose of Lima Church in Paso Robles". saintrosechurch.org. Retrieved 7 April 2018. ^ "St. Rose of Lima Catholic Church". stroseonline.org. ^ "Saint Rose Catholic Church – We seek to heal, console and listen to the people". stroseonline.org. ^ "St. Rose of Lima > Home". strosebuenavista.org. ^ "Home". St. Rose of Lima Roman Catholic Church. ^ a b Michael Hoerner. "St. Rose of Lima – Diocese of Springfield in Illinois". dio.org. ^ "Saint Rose of Lima Catholic Church". saintrosequincy.org. ^ "St Rose of Lima Catholic Church". strosechurch.saintrose.net/. ^ "Saint Rose of Lima Catholic Church – Prince of Peace Parish – Diocese of Dodge City". greatbendcatholic.com. ^ "St. Rose of Lima". St. Rose of Lima. ^ "Your Page Title". strose-parish.org. ^ Ste Rose. "Ste. Rose de Lima Parish". Ste. Rose de Lima Parish. ^ "Saint Rose of Lima – Northborough MA". saintroseoflima.com. ^ "St Rose of Lima Parish Topsfield, MA 01983". parishesonline.com. ^ "Home – Saint Rose of Lima Catholic Church". Saint Rose of Lima Catholic Church. ^ "St. Rose of Lima Church & School". www.stroseparish.info. Retrieved 7 April 2018. ^ "St. Rose of Lima, East Hanover". St. Rose of Lima, East Hanover. Retrieved 7 April 2018. ^ "St. Rose of Lima". stroseoflimafreehold.com. ^ "Saint Rose of Lima School Website". Saint Rose of Lima School Website. Retrieved 8 July 2017. ^ "Saint Rose of Lima Parish Website". Saint Rose of Lima Parish Website. Archived from the original on 26 March 2015. Retrieved 6 March 2015. ^ metatags generator. "Saint Rose School and Parish Perrysburg Ohio". saintroseonline.org. ^ "St. Rose / St. John Parish History". stroselimaohio.org. ^ "St Rose of Lima Catholic Church, Altoona, PA". stroselima.com. ^ "St Rose of Lima Catholic Church – Murfreesboro, TN". saintrose.org. ^ "Santa Rosa Catholic Church, Andice Texas". srdl-cc.org. ^ "St. Rose of Lima Catholic Community, Houston, Texas". stroelima.org. Retrieved 7 April 2018. ^ "St. Rose of Lima Catholic Church: Welcome!". St. Rose of Lima Catholic Church. ^ "St. Rose of Lima Catholic Church". saintroseoflimacheney.org. ^ "St. Rose of Lima Catholic Church". strosecubacity.weconnect.com/. Wikimedia Commons has media related to Saint Rose of Lima. José Flores Araoz, et al. 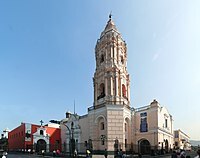 Santa Rosa de Lima y su tiempo. Lima: Banco de Crédito del Perú 1995. Luis Getino, O.P. Santa Rosa de Lima, patrona de América: su retrato corporal y su talla intelectual según nuevos documentos. Madrid: M. Aguilar 1943. Leonardo Hansen, Vida admirable de Santa Rosa de Lima, translated by Fr. Jacinto Parra. Lima: Centro Católico 1895. Fernando Iwasaki Canti. "Mujeres borde de la perfección: Rosa de Santa María y las alumbradas de Lima," Hispanic American Historical Review 73, no. 4 (1993):581–613. Pedro de Loayza, O.P. Vida ad Santa Rosa de Lima (1619) Reprint, Lima: Iberia, S.A. 1965. Ronald J. Morgan, "Heretics by Sea, Pagans by Land: St. Rosa de Lima and the Limits of Criollismo in Colonial Peru", chapter 4 of Spanish American Saints and the Rhetoric of Identity. Tucson: University of Arizona Press 2002, pp. 67–97. Tomás Polvorosa López, "La canonización de Santa Rosa de Lima a través del Bullarium Ordinis F.F. Pratedictorum" in Actas del I Congreso Internacional sobre los Dominicos y el Nuevo Mundo, pp. 603–639. Madrid: Editorial DEIMoS 1987. Rubén Vargas Ugarte, S.J. Vida de Santa Rosa de Lima. 3d edition. Buenos Aires: Imprenta López 1961.